Emilie isn't your average girl... Not anymore. After being deliberately mowed down by a vehicle and killed while walking home late one night, her body was taken. She isn't Emilie any more, she's project thirteen. Created and reborn as a machine, an interactive program in the guise of a seventeen year old girl. She has no recollection of who she was, she can neither feel or recognise emotions, so when an ally from her past reinstalls her memories, project thirteen becomes a hot commodity that the corporation is desperate to find. On the run with her new sense of self, Emilie stumbles across the lonely and destitute Colton. Colton is troubled and broken, and wants to find the easy way out. With her emotions on high alert, Emilie can't leave him behind and the two strike up an easy friendship. Colton doesn't know what Emilie is, but can see that she's more than your average girl. Discovering that beneath the facade, Emilie doesn't bleed, she has incredible strength, speed and intelligence, doesn't phase Colton. He won't leave her, even if his own safety is at risk. The Vesta Corporation will stop at nothing to recapture their greatest asset. It seems that Emilie and Colton have more in common than they first thought. 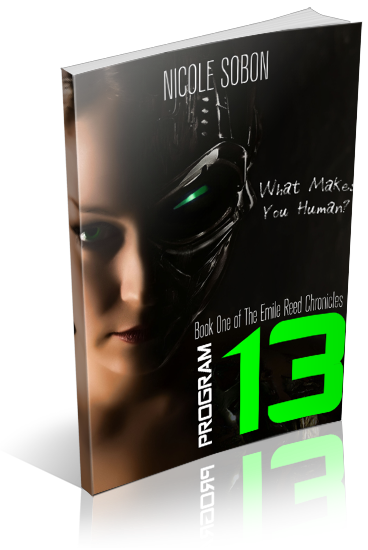 Program 13 is the story of a girl who had her life cut short at the hands of a corporation, with the vision of creating the perfect being. Emilie has been stripped of her humanity, but once her internal program is updated with that of her former life, memories and emotions, she struggles to maintain her identity. Well written and young teen fantasy fans will enjoy the science fiction aspect. I kept waiting for more action, craving more as the story progressed, but sadly it never came. I'm assuming that Program 13 is the springboard into the series, concentrating on character development and the history of the Vesta Corporation and what drives the technology. A clean read for the younger audience. Thanks Giselle, lovely to see you again.